Primary pupils from across Aberdeenshire took to the stage on Friday, March 29 for the Global Rock Challenge 2019 J Rock event. Fraserburgh South Park Primary School were named the winners with their performance 'Trick or Treat? Up Witches Street'. They were followed by Fraserburgh's St Andrews Primary School in second with 'Mother Nature's Dream'. Meanwhile Strichen School were third with 'Titanic' and Stuartfield and Fetterangus Primary School came fourth with 'Apollo 13'. Banffshire and Buchan Coast MSP Stewart Stevenson, first place prize presenter, said: "The J Rock is a really wonderful event for so many local schools, everyone who comes here enjoys themselves. It engages the communities, the whole school and the skills and talent I see on the stage and a world away from the kind of kid I was when I was at primary school. "Well done to everybody who has been involved and of course to tonight’s winners Fraserburgh South Park in particular." Aberdeenshire Council Award of Excellence for Choreography - St Andrews Primary School and Fraserburgh South Park Primary School. Aberdeenshire Community Safety Partnership Award of Excellence for Performance Skill - St Andrews Primary School and Fraserburgh South Park Primary School. NHS Grampian Endowment Fund Award of Excellence for Stage Use - St Andrews Primary School and Fraserburgh South Park Primary School. Securigroup Award of Excellence for Concept - Fraserburgh South Park Primary School, Strichen School and Port Erroll School. Aberdeenshire Council Award of Excellence for Drama - St Andrews Primary School, Stuartfield and Fetterangus Primary Schools, Fraserburgh South Park Primary School, Kellands Primary School and Strichen School. Aberdeenshire Community Safety Partnership Award of Excellence for Soundtrack - Clerkhill School, St Andrews Primary School, Stuartfield and Fetterangus Primary Schools, Fraserburgh South Park Primary School, Strichen School and Port Erroll School. NHS Grampian Endowment Fund Award of Excellence for Set Design and Function - Clerkhill School, Buchanhaven Primary School, St Andrews Primary School, Stuartfield and Fetterangus Primary Schools, and Fraserburgh South Park Primary School. Securigroup Award of Excellence for Costuming Character - Clerkhill School, Buchanhaven Primary School, St Andrews Primary School, Stuartfield and Fetterangus Primary Schools, and Fraserburgh South Park Primary School. Rock Clothing Award of Excellence for Visual Enhancement - St Andrews Primary School, Fraserburgh South Park Primary School and Kellands Primary School. Aberdeenshire Council Award of Excellence for Entertainment - Clerkhill School, Buchanhaven Primary School, St Andrews Primary School, Stuartfield and Fetterangus Primary Schools, Fraserburgh South Park Primary School, Kellands Primary School, Strichen School and Port Erroll School. John Gordon Charitable Trust Award of Excellence for Lighting - Fraserburgh South Park Primary School and Clerkhill School. 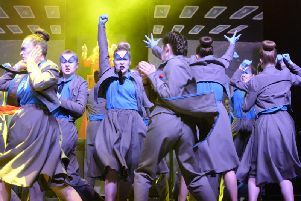 Rock Challenge Award of Excellence for Stage Crew - Clerkhill School, Buchanhaven Primary School, St Andrews Primary School, Fraserburgh South Park Primary School, and Stuartfield and Fetterangus Primary Schools. Securigroup Award for Spirit of J Rock - Kellands Primary School. Aberdeenshire Community Safety Partnership Award for Performers’ Choice - Strichen School. Be Your Best Foundation Award for Student Leadership - Stuartfield and Fetterangus. J Rock Award for School Community Support - Stuartfield and Fetterangus. Be Your Best Foundation Award for Healthy Lifestyle - Buchanhaven Primary School. J Rock Award for Cultural and Educational Achievement - Clerkhill School. Be Your Best Foundation Award for Positive Inclusion - Clerkhill School. Be Your Best Foundation Award for Parental Involvement - St Andrews Primary School.